This SharePoint Online PowerShell tutorial explains, delete site collection SharePoint online PowerShell. We will also see how to restore deleted site collection using PowerShell in SharePoint Online Office 365. We will also discuss how to delete SharePoint Online site collection permanently using PowerShell in SharePoint Online Office 365. How to Set up your SharePoint 2013 Online Management Shell to connect to SharePoint online sites? We can use Remove-SPOSite PowerShell cmdlets to move the site collection to the recycle bin in SharePoint Online Office 365. This command will not delete the site collection permanently instead it will just move to the recycle bin in SharePoint Online. Just to let you know that you must be a SharePoint Online global administrator and a site collection administrator to run the below cmdlet. Even if you are a SharePoint Online global administrator, it will not allow you to delete the site collection if you are not a site collection administrator. Below is the PowerShell command to delete the site collection in SharePoint Online Office 365. The above PowerShell cmdlets delete a SharePoint Online site collection permanently. Similarly, if you want to restore the deleted site collection from recycle bin in SharePoint Online Office 365, you can run the below PowerShell cmdlets. Once you run the above command, the site collection will be get restored from recycle bin in SharePoint Online Office 365. 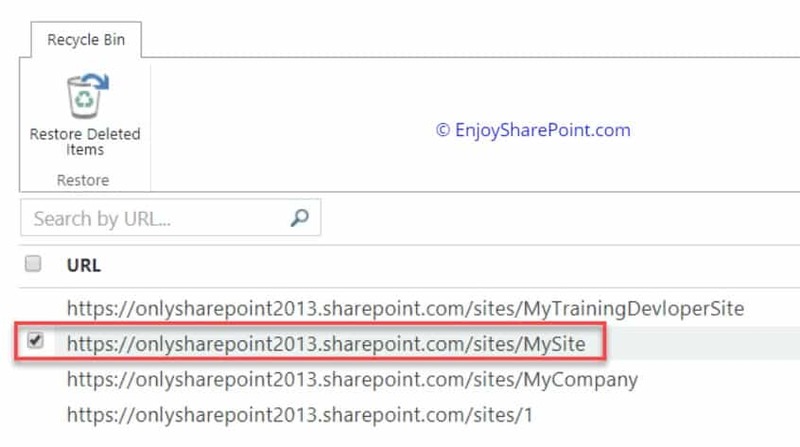 Hope this PowerShell SharePoint tutorial explains how to delete site collection in SharePoint Online using PowerShell? How to permanently delete site collection using PowerShell in SharePoint Online Office 365? Also, how can we restore a deleted site collection from recycle bin using PowerShell in SharePoint Online Office 365?